The running training schedule below is Step 2 of our Beginners Running Program which will help you to learn how to start jogging if you have never done it before. This running training program aims to increase you endurance or fitness to run for a long period of time. I’m hoping that these beginner tips helps to answer the questions from all clinics at the Ottawa Physiotherapy sites including Barrhaven physiotherapy, Westboro physiotherapy, and Orleans physiotherapy locations. hings you should know about running shoes, clothes, running cramps and running stretches before you start your daily workout schedules. So, you have clearance from your doctor, bought a good pair of running shoes and full of motivation to lose weight, get fit and better yourself, so let’s get started! 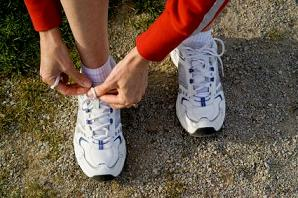 Always warm up properly before you start by walking for 5 – 10 minutes. You should always finish running with cool down – 5- 10 minutes walk. Ready for your first 30 minute jog. OK, walk for the first 5 minutes at a good pace to warm up. 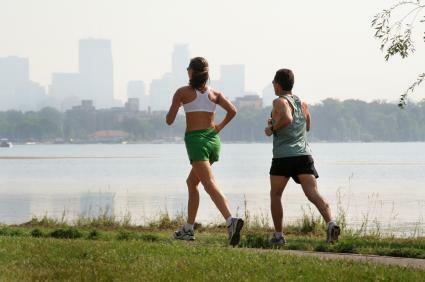 Then mix jogging at an easy pace for 1 to 2 minutes with walking for 5 minutes at a time. Repeat 3 times with the last 5 minutes walking as part of your cool down routine. How was that? If you are out of breath – you are going too fast. Your breathing during your running training schedule should not be heavy and you should be able to carry on a conversation during running. Unfortunately depending on your age, and your fitness level, we all develop at different rates, so you’ll need to judge when to step things up or down a bit. Repeat the above 2-3 times in a week. But take 1-2 days off in between each jog, and make sure you drink lots of water. We’ll stick with 30 minutes, but this time, after your 5 minute walk out, mix jogging at an easy pace and walking for 2 minutes at a time, repeat 3 times with the 5 minute cool down walk at the end. Aim for 3 sessions in the second week. Walk for 5 minutes to warm up then mix 3-5 minutes jog with a 2 minute walk, repeat 4 times with 5 minutes walk at the end to cool down. Aim for 3 sessions in week 3. Week 4: Walk for 5 minutes then mix a 7 minute jog and 2 minute walk, repeat 3 times with a 5 minute walk at the end. Do 3 sessions in week 4. Warm up with a 5 minute walk, then run for 8 minutes and walk for 2 minutes – repeat 3 times. Do not forget to walk at the end for 5 minutes to cool down. Do 4 sessions per week. Walk for 5 minutes, then jog for 9 minutes and walk for 2 minutes – repeat 3 times with 5 minutes walk at the end. Aim for 4 sessions in week 6. After your first 5 minutes walk, run for 11 minutes and walk for 1 minute, repeat 3 times finishing with a 5 minute walk to cool down. Do 4 sessions this week. If you have managed to keep up with this running training schedule so far great, your target this week is 3 sessions with a 30 minute run at the end of the week. If you haven’t kept up, do not feel bad or demotivated. Just progress at your pace, and believe me you will get there. So walk for about 5 minutes, and then jog for about 20 minutes with another 5 minutes walk at the end. The goal here is to jog for 20 minutes without stopping. In the next session, move onto 25 minutes, starting and finishing with 5 minutes walk. During session 3, you can do your first 30 minute run without stopping, starting with 5 minutes walking as usually. After a 30 minute run, that’s enough! Just walk home to cool down. I have been asked a lot of questions on how to start running at our Orleans physiotherapy and Westboro physiotherapy locations. So I’m going to break things down in a series of articles to cover the basics to give people ideas on what to think about or try. Get approval from your doctor – you do not want nasty surprises! Running shoes. Getting a pair of good running shoes is very important for injury prevention and your comfort. Get expert advice from a proper running shop – not some fashion chain on the high street. In the running shop, a sales person will encourage you to do to the running test to find out your foot type and level of support you need to help to choose the right pair. The proper running shoes come at a price (normally expect to pay $70 – $140), but they will be worth it! Get the best sports bra you can find if you are a lady. Clothes. Should be comfortable, how fashionable you want to look it is up to you – you might just go for t-shirt and running shorts or you might want to buy clothes such as CoolMax or Lycra which take sweat away from the body. Plan your route. Try to keep your route on reasonably flat ground. One steep hill at this stage will be too difficult. Stick to the pavement or sidewalk if you can, roads made of dirt or asphalt are better then concrete which is hard on the body. If you are using a treadmill, a cushy surface gives you more protection from injuries. Running at night. Always remember about your safety – wear reflective clothing, run towards traffic. Leg cramps running. Running too fast too soon causes muscles cramps. If it happens just gently stretch the muscle. Stomach cramps. Running before your meal has digested causes stomach cramps – wait 2-4 hours after a big meal (dairy, meat and fat –takes time to digest). Side stitches (a sharp pain below the rib cage) can be prevented by taking evenly spaced deep breaths. If your breathing is not deep the diaphragm does not have enough time to lower for the ligaments to relax. The diaphragm tenses and causes a stitch. Keep yourself hydrated. Before running – Drink 3- 4 cups of water a few hours before running. During running (especially in hot weather) – 8 to 10 ounces of water recommended for every 15 to 20 minutes of strenuous exercise. Replenish your fluid after running; drink as much water as you like. Running stretches help to improve muscles flexibility and feeling less fatigued, also to prevent injuries. Always stretch after your running workouts. Running Tips Breathing. A correct breathing technique during running is very important for delivering enough oxygen to the muscle which helps to increase your endurance.